Buncom & Baguettes: Local Favorites! Happy February Local Produce Enthusiasts! 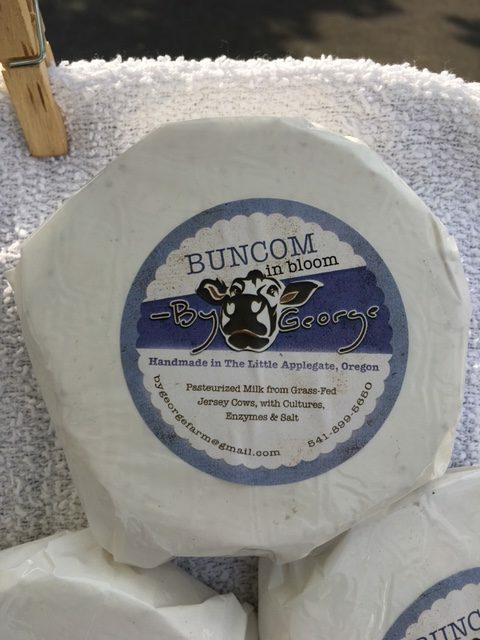 Buncom in Bloom, a delicious brie cheese from By George Farm, in Jacksonville; and fresh baguettes from La Baguette Bakery, in Ashland, are back on the list at the Rogue Produce Online Farmers Market! These two items are included in the “Whole Kitchen” CSA Share, and we’ve got 2 other unique CSA Shares with varied assortments of local fare ready to order for home delivery. The Whole Kitchen Share has ground beef and smoked peppered jerky from Dauenhauer Cattle, in Ashland, Buncom in Bloom from By George Farm, red D’Anjou pears, Romaine lettuce, red onion, Crimini mushrooms, eggs, and a fresh baguette! We purchased a fresh baguette from La Baguette at the Ashland Food Co-Op last week and we just had to add them to our list. The Veggie Share this week is inspired by the yellow corn polenta from David at Dunbar Farm, in Medford. It seems that by this time in the Winter we always start to crave it, and it’s delicious when you add fresh rosemary (also supplied by Dunbar Farm) to it while it’s cooking! The Veggie also has red onion, crimini mushrooms, and some delicious arugula from Matt Suhr at Happy Dirt Veggie Patch. We’re also very excited to try the raw sprouted almonds from Maria at Higher Power Raw Foods; a friend of ours recently recommended having them in oatmeal – a super nutritious breakfast idea! We also include the Onion Crackers from Maria, and a delicious bag of cheese curds from By George Farm! 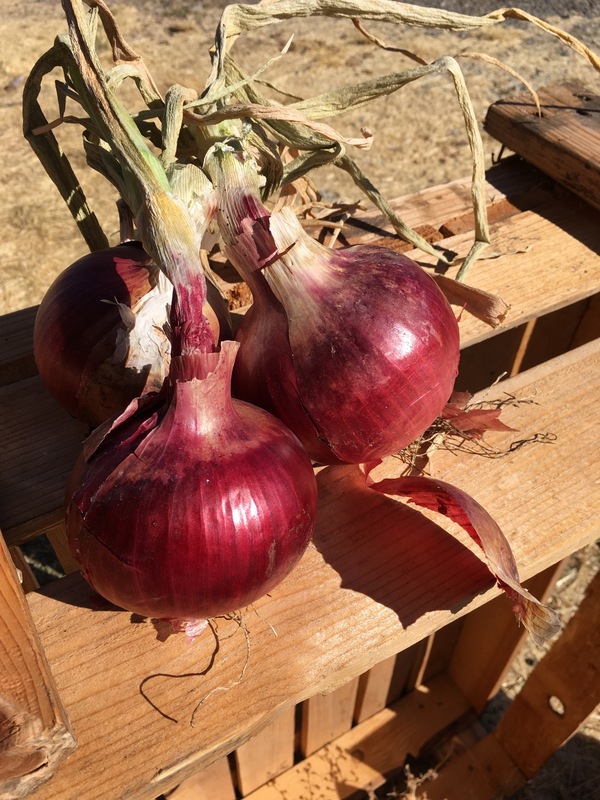 Red onions coming this week! We’re rocking the the Omnivore Share this week with more lamb from Rock Field Farm, in Central Point. This week it’s a leg of lamb (boneless), and we’ll include recipes from Angela (owner at Rock Field Farm) for you once again. Here’s a link to Angela’s blog where you can find delicious recipes for leg of lamb and other lamb meat cuts that are available to order at our Online Farmers Market. We’re going for a Mediterranean theme by adding Romaine lettuce, red onion, crimini mushrooms, raw goat feta from Dave at Oak Leaf Creamery, and red D’Anjou pears! Other items to note this week are the sale prices on several Bright Earth Foods products, including the Raw Green Smoothie Mix ($29.99) and the 1 quart jar of Coconut Oil ($15.95). You can’t find these local products at this price anywhere else – and we deliver them right to your home or business! We’ve heard through the grapevine (which there are plenty of around here) that there will be spinach popping up at one of our favorite local farms for our next home delivery! Make sure to sign-up for deliveries from Rogue Produce so you can take part in receiving all of your favorite local fare! If you’d like a home delivery next Friday, February 8th, please submit the online form by Monday at 5:00pm.